Will Triangle's new speaker prove heroic? In retrospect, this is the Concerto we should have had all along. The SW2 is more rounded and easier to integrate into hi-fi systems and most rooms. It looks beautiful - the polished finish is exquisite, and clearly an improvement on the original. now with better treble and more substantial bass. One of the few high-end speakers that doesnt punish you for leaving the chair. Costly, difficult to manoeuvre, and some are bound to miss the endearing idiosyncrasies of the original. The Triangle Magellan Concerto was new in January 2005. It has already been upgraded. This latest version is instantly recognisable as a member of the Magellan family, and it has a similar (but not identical) configuration to the original Concerto. Forget the appearance though; this is effectively a new model, signalled by a change in name to SW2. It has increased in price by nearly 50 per cent, and is also larger; up from 55kg to 65kg, with a significant size increase too. Notably, the speaker sits on a large plinth which is in fact a clever proprietary floor decoupling system called SPEC. It employs damping by using directive elasticity pads, effectively cancelling vibration to the ground. A key element in the new SW2 design is improved bass performance and a higher maximum output level. Laser accelerometer examination of the enclosure led to much improved bracing; there are now seven peripheral shelf braces linked by a large vertical brace, all cut away to allow free airflow. Further resonance control comes from smaller details, such as the new elastomer grommets used with the fixing screws for the midrange drivers, and a damping gasket behind the midrange driver. Together these ensure that no part of the midband driver ever touches the enclosure directly. Triangle has some very impressive graphical data on the decoupling, which translates into a sharp decrease in midrange coloration when listening. Even the construction of the enclosure has been rethought, allowing improved accuracy of build, easier construction, a lowered centre of gravity, better appearance and enhanced control over mechanical and acoustic problems within the cabinet. As you'd expect, it's wood veneered, with ten layers of varnish, each polished before the next is applied. As such, it looks fantastic. Other changes have been made to prevent unwanted energy in the enclosures from feeding to earth, and causing the front spike to rattle. The drive units have also been redesigned for the new version. You may recall that the original Magellan series used a fierce looking and directional horn-loaded tweeter. The new model is much less directional, especially above 15kHz and changes to the motor system reduce distortion at the low frequency end of its passband. Finally, the phase plug has been redesigned to reduce distortion. This smaller unit has new phase plug coatings as aerodynamic aids to reducing distortion at the frequency limits. The magnet structure has also been refined, and power handling has been improved with detail changes that enhance heat dissipation. The original Magellan used a version of the Triangle 160mm driver for both midrange and bass duties. In the new model, the same size unit is used for the midrange, but new drivers with larger 210mm diaphragms have replaced the bass units. All the diaphragms themselves are new, using so called SVA (Sandwich Vert Alveolaire, or Green Sandwiched Foam). This is a sandwich structure with two glass fibre layers and a cellular foam core, which on paper at least bears a superficial resemblance to the cones used on larger Focal units. It also features a new low-Q motor system with what is claimed to be a more homogenous magnetic field, and a new high power, four-layer, long displacement voice coil. The same heat dissipation measures developed for the midrange unit are employed here too. The final batch of changes were applied to the crossover, which employs 24dB slopes between the bass and midrange units, and 12dB slopes from mid to tweeter and vice versa. The crossover networks themselves are said to be more accurately aligned to the loudspeaker's natural frequency responses, and to present a more nearly resistive load to the amplifier. As a system, Triangle claims reduced phase distortion and improved, more uniform directivity. This is a complex design task in a case like this, where the system features three front facing bass units, including a single midrange and tweeter on the front and a rear facing tweeter and midrange. The aim is to maintain dispersion around the enclosure, front and rear, and reduce directivity, which in turn makes the system less position critical, because it reacts less severely to adjacent walls. The responsible technology is called DPS 2 (Dynamic Pulse System), which is designed to ensure that the speaker behaves similarly up to 30 degrees off from the direct frontal axis, so the sweet spot is much wider. The new model has a sensitivity lower than its predecessor, but still high, however, at 90dB. This is combined with a high power rating of 200 watts, with an impedance of four ohms (nominal). The new Magellan has made what can only be described as a lurch to the centre ground, losing some of its distinctiveness and character in the process. This was almost certainly the idea, and it works superbly in its new form. The good points of the original models have largely been retained, or even built upon, including their wonderfully passionate style of music-making. It is only the questionable aspects of the original Concerto that have been excised. The main changes are at the frequency extremes. The old model was largely dominated by the treble, which was sharp, pure and responsible in large part for the unusually high resolving power of the design, in concert with the fast, agile midband. The old Magellan, however, was rather bright - in the wrong kind of system it could even end up sounding fierce, and its voicing could change quite abruptly with listening axis. This may have even been one contributory reason why rear facing drive units were included in the design. They didn't do much on the primary listening axis, but the early reflections served to iron out inconsistencies in the reverberant soundfield when listening off-axis. The changes to the tweeter have the effect of making the treble much smoother and more neutral. No longer does it have the sharp, even spiky character of old, and because it is now designed to work over a 60 degree cone, it is much more consistent for those not sitting dead centrally. Sit (or stand) in the firing line, and the balance barely changes. Further off axis you still have the benefit of the rear facing mid and tweeter on the reverberant soundfield. The other very obvious change is to the low frequency balance. The original was notable for its sharp transient response even through the lowest octaves, but few would accuse that model of having a particularly deep, extended bass. The new model is clearly a reformed character; it is deeper and fuller. 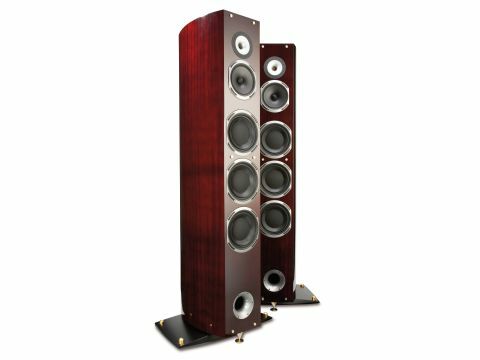 The bass is more extended and muscular, and when it is needed, this speaker knows how to put its foot down to make a point. In our original review of the Concerto two years ago, we referred to the Sinopoli recording of Mahler's eighth symphony (the Symphony of a Thousand), and noted that 'in a run through of the shattering finale... the organ that underpins the final section lacked the power and the almost visceral trembling on the air that might have been present (and that) ironically for such a large loudspeaker, this is a design that could even benefit from an external subwoofer'. We dug out the same recording again for a rerun, and it was immediately clear that this criticism no longer applies. The new model offers more depth and weight certainly, but it has been subtly revoiced elsewhere, too. The speaker now has a more architectural and integrated feel, especially when driven by our Krell FBI integrated amp. Tonal colours are more varied, and generally a little darker and more resonant and sonorous. And the musical effect of the Mahler, which relies on such things, was immeasurably more impactful. In many ways, this impressive floorstander is closer to industry norms in overall balance than the model that came before. It is also closer to its natural competition from the Focal Utopia stable, though not necessarily to any individual model in that range. In fact, the Magellan still probably offers a better focused and sharper image of the music than some of the Utopias. You should find it easier to identify suitable matching electronics as it is much more mainstream and less fussy in its requirements. Surprisingly, it works well in a room that has a smaller floorplan (but greater height) than the one I was using at the time of the original review. The Concerto SW2 sounded completely at home and in proportion in the new surroundings, which impressed. You gain and you lose here. The loss is of individuality, but the speaker's temperament is more neutral and forgiving, and it is also much more practical. You won't, for example, need a warm-sounding valve amp just to make it civilised enough to use. The Concerto SW2 is a powerful and expressive speaker, with enormous reserves of resolving power.